Heavy-duty and extremely flexible, the Flow series parallel shaft and right-angle mixers are designed to meet the needs of your large-scale industrial, chemical, or sanitary mixing applications. Mixer-duty electric motors are available in a variety of sizes, phases, and voltages chosen based on your need. Other options include washdown duty, inverter duty, DC electric, and explosion proof motors. Air motors are also available. A complete line of double-helical, parallel shaft gearboxes with multiple gear ratios is available for quiet and efficient operation per your application. Gearboxes come standard with synthetic lubrication (lubed for life). Minimum of 1.5 mechanical service factor on all gearing and bearings. Helical-bevel gearboxes with double or triple reduction gear arrangements provide quiet operation and extended life. Hundreds of gear ratios are available. Worm drive gearboxes offering single or double reduction worm gear arrangements allow high shock loading and economical design. Thirteen gear ratios are available to match process requirements. Virtual drywells and heavy-duty output bearings are typically used on large units for reduced vibration and to allow for longer shaft lengths. Rigid in-tank couplings used as required. Closed Tank configurations are available with vapor seals, stuffing box glands (up to 150 PSI) and single or double mechanical seals (300+ psi). 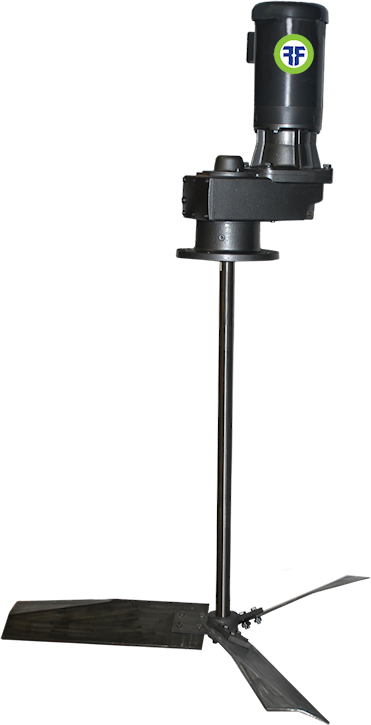 In-tank shutoff mechanism allows seal changes on side entry mixers without emptying the tank. Stainless Steel components, Steel-It™ USDA–compliant paint, polished shafts and various shaft coatings are available for sanitary applications and chemical resistance. Various impeller styles and mounting options including ANSI flange mount, TriClamp mount, and beam mount are available for your process.